While we're waiting for iOS 4 for the iPad to bring us native WiFi printing, there's a handy free app available right now for folks who use HP printers. HP iPrint Photo 3 enables you to print photos in a variety of sizes -- from snapshots all the way up to A4. The software also includes easy wireless document sharing between your Mac and the iPad. Then, if you want, you can print those PDFs or text files directly from the iPad. Nifty stuff. 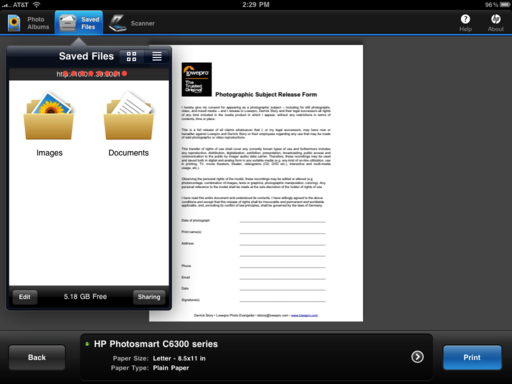 Wireless document sharing from my Mac to the iPad was a pleasant surprise with HP iPrint. All I had to do was drag my files to the server icon on my Desktop, and they instantly appeared on my mobile device for reading, storing, and printing. I tested this application on my HP C6380 "All in One" and on the HP C8100, and it worked smoothly on both. I could print any photo on my iPad, or save PDF and text files from my Mac to the iPad for printing later. Once I have the documents stored in HP iPrint, I can output them to any compatible HP printer, regardless of where I happen to be at the moment. The first items I added were model releases, just in case I have to output extras on the road. If you're curious about your printer and this app, here's the official list of compatible devices. 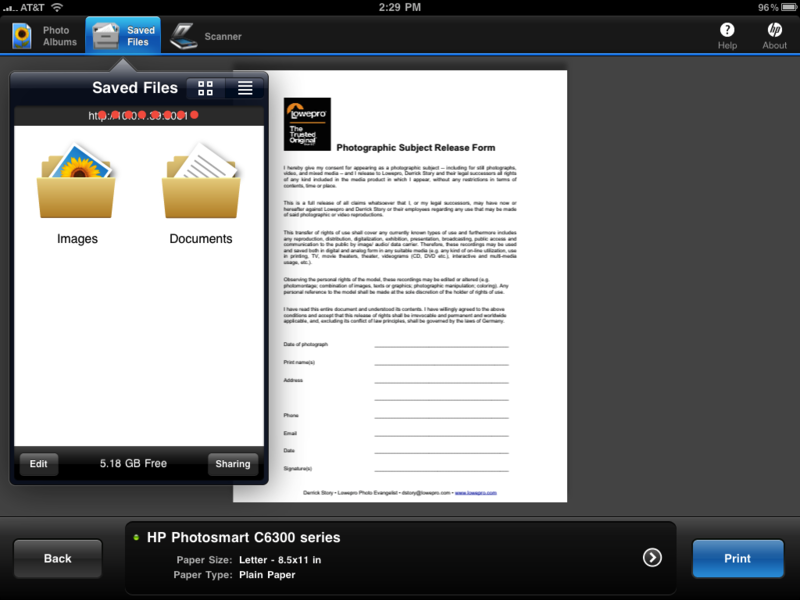 If you have an HP e-All-in-One device, you can also scan documents and photos wirelessly from the device to your iPad. There are a few basic editing tools too. If, for example, your photo isn't sitting on the paper the way you want, you can use the two-finger pinch, expand, or rotate to reposition the image. This is particularly handy for shots that have different dimensions than the paper you want to print them on. If you get stuck, there's a terrific Help menu available in the upper right corner of the application.